We were delighted to welcome The Happy Pear twins, David and Stephen Flynn, to the Positive Life fold in our Spring 2019 issue! They shared a gorgeous pizza recipe that will be perfect for the coming days and weeks, when the heat gradually returns and we feel more inclined to embark on spring picnics. Enjoy! We started The Happy Pear to create a happier, healthier world, and to build a community. We believe that community and friendship play a big role in our human journey: nurturing us as individuals as well as our business. When it comes to sharing food with your friends and community, pizza is the ultimate choice. This year, Stephen got the most amazing Christmas present from his wife: a wood fired pizza oven! He’s been having such fun with it, trying to perfect his pizza dough recipe. So, here is our healthy, super-quick and no-yeast pizza recipe to try with three different toppings. A couple of the topping ideas come from Rome – they might seem a bit out there, but they are tasty and they work! Sift the flours and baking powder into a bowl, then add the salt and oil. Mix well in a circular motion, using your clean hands held in a claw-like shape. Make a well in the middle and slowly add the water. Coat your hand with a little flour and mix until all has come together. Divide the dough into four equal-size balls. Coat a rolling pin with a little flour to stop it sticking. No need to knead the dough, just roll it out using the rolling pin. Roll each ball out as thin as you can (no more than 5mm thick), to ensure a crispy thin base. Sprinkle a little oil and flour on a baking tray to prevent sticking, then gently place your base on the tray and bake in the preheated oven for 8 minutes, without any topping, to ensure a crispy base. Meanwhile, in a small pot, boil the sundried tomatoes for 5 minutes, until they become soft and easier to blend, then drain the water. Peel the garlic. Put all the ingredients for the tomato sauce (including the sundried tomatoes) into a blender, and whiz until smooth. 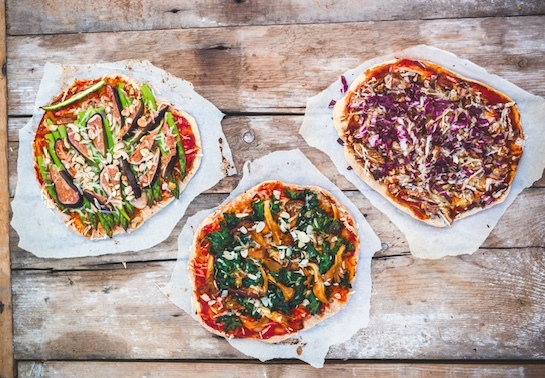 Here are three of our favourite topping suggestions (each recipe is enough for four pizzas). Boil the potatoes until soft, drain, then mash using a potato masher or large fork, adding the oat milk, olive oil, salt and ground ginger until the mash is thick, but has a nice creamy taste. Chop the radicchio in half, remove the firm core in the centre and bottom that is holding it together, and cut the rest into thin, small bite-size pieces. Grate the cheese. Lightly crush the walnuts. Slather a generous serving of tomato sauce on your precooked pizza base, but aim for only a quarter of the sauce you’ve made – you don’t want to make the base soggy. Gently spread over the mashed potato to give a decent base layer. Next, sprinkle on about three-quarters of the radicchio, the lightly crushed walnuts and a good handful of cheese. Transfer to a warmed baking tray and bake in your hot oven for 8 minutes, until the base is nice and crispy, and the topping is turning golden. Bake for longer if the base is still soft. Sprinkle with the rest of the radicchio to give it a nice pop of colour. Using your clean hands, remove the kale from its stalks and rip into bite-size pieces. Add the oil and salt and massage for a minute, allowing the salt to tenderise the kale. Grate the cheese. Roughly chop the mushrooms and put them into a bowl. Add the tamari and mix well so that each piece of mushroom gets nicely coated. On your pre-cooked pizza base, spread a generous serving of tomato sauce (about a quarter of the quantity you’ve made). Cover with kale, a good sprinkling of cheese and some oyster mushrooms, and sprinkle some almonds on top. Lay the base on a heated baking tray and put into the hot oven for 4–6 minutes, until the cheese melts and the base starts to brown slightly. Thinly slice the figs and grate the cheese. If using asparagus, remove the woody base of each spear. In a bowl, dress the asparagus spears with the oil and salt. Spread about a quarter of the tomato sauce you’ve made on your pre-cooked pizza base, then sprinkle over the cheese and a layer of figs. Top with asparagus and a sprinkle of whole or chopped cashew nuts. Transfer to a warmed baking sheet and cook in the hot oven, until the cheese melts and the base starts to brown slightly and crisp. We Recommend: Yoga Kitchen on Good Friday! !